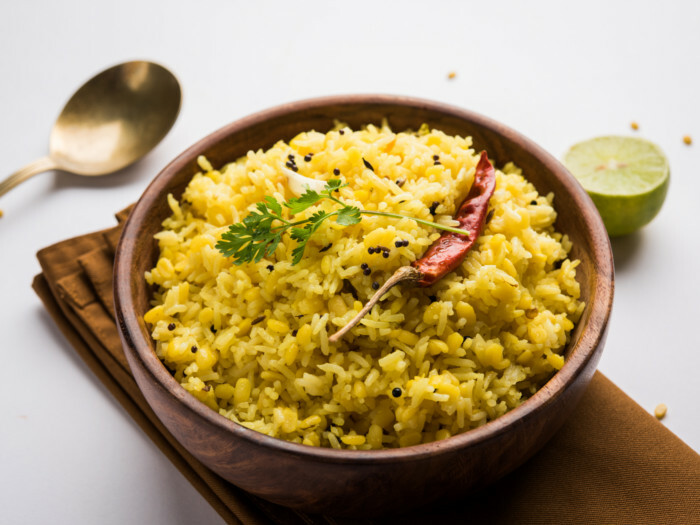 If there’s one dish that can single-handedly meet with your carbohydrates, protein, vitamins, and mineral requirements, it’s khichdi or khichadi. Khichdi is an Indian one-pot lentil and rice dish, which is cooked to perfection in a span of not more than 30-40 minutes (depending on your preferred khichdi recipe). Khichdi is typically seasoned with turmeric and salt and served with a spoonful of ghee or clarified butter on top. Not only is the dish palatable, but it is also extremely nutritious, aiding in digestion and weight loss, whilst boosting heart health. So, without wasting another minute, let’s follow these easy khichdi recipe steps. 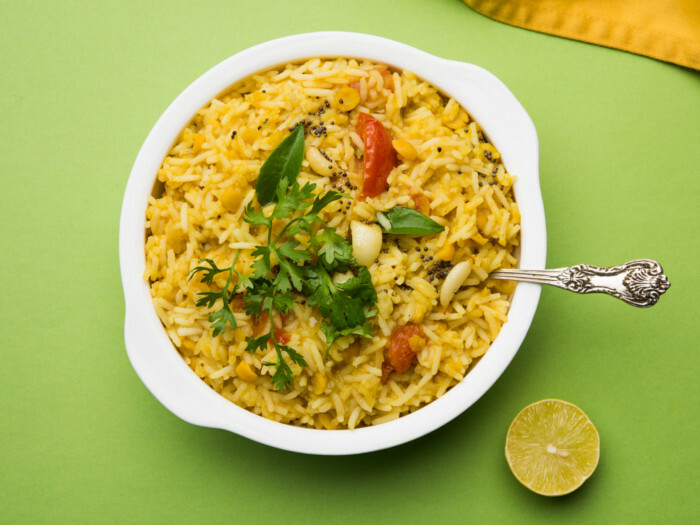 It is fairly simple to prepare khichdi. Follow the simple instructions below to prepare these nutritious, yet delicious, Indian dish. For this particular khichdi recipe, first, soak the lentils in water for 30 minutes before you start cooking. Ensure you drain the water completely thereafter. This will help soften the lentils and reduce cooking time. Take rice and lentil in a bowl in the aforementioned proportion and rinse it thoroughly. Thereafter, place it in a pre-heated large pot with 2 cups of water and let it cook on medium heat for some time. Thereafter, add the spices to the rice and lentils' combination. Add water and bay leaves and bring it to a boil. Ensure you boil it for at least 10 minutes. Turn the heat low, cover the pot and continue to cook until the rice and lentils soften. This is expected to take at least 30-40 minutes. Alternatively, you can cook it in a traditional pressure cooker for 20 minutes. Before serving, add the cilantro leaves and salt to taste. Enjoy your meal hot with a tsp of ghee/clarified butter on top! Among the most common and noteworthy variants of khichdi is the one made with mung beans or moong dal, which is very good for digestion. Let's take a look at the recipe below. Soak the dal in water for 15 minutes at least before beginning to cook. Ensure you drain the water completely before you start cooking. Meanwhile, if you wish to add vegetables, chop them into fine pieces and keep aside. Take a pre-heated large pot and heat clarified butter in it. Add cumin seeds and allow it to crackle in the clarified butter. Once it turns brown and the fragrance of the spice is released, fry the ginger root on medium heat. Ensure it doesn't get burnt. Add asafoetida that has many benefits and adds flavor to any recipe. Thereafter add chopped onions and green chilies. Ensure that the raw smell of the onions goes away. Now, to this add chopped tomatoes, salt, and turmeric and saute until they turn soft and squishy. If you're adding carrots and beans, then add them here and saute for few more minutes till they soften. Add drained mung beans/skinned split mung beans and rice to the mixture and saute for 3-5 minutes. Add 3 to 4 cups of water to it. Now cover the pot and continue to cook until you get it to a porridge-like consistency. Add salt as per taste. Stir well. Add a tsp of ghee to enhance the taste. Enjoy it as a hot meal! You can make khichdi using millets, oats or brown rice as well if you want to make it more nutritious. Usually, khichdi, made of broken wheat and mung beans, is served when a person is unwell or has weight loss and detox in mind. You may use other vegetables like spinach, sprouts, broccoli or cauliflower. You can also add meat to it when not consuming it for cleansing purposes. Khichdi is best enjoyed along with yogurt/raita, pickle, chopped onions or papadum on the side. To make the dish vegan, just skip the ghee and use oil only. Khichdi tastes best only when it is warm. As it begins to cool, it tends to get thick. Just add more water and a little salt while warming it on medium heat and bring it to the desired consistency, following which it’s good to eat. Average rating 3.9 out of 5.0 based on 12 user(s).